Celestyal Olympia has undergone a number of reincarnations in its 34 years afloat. The 1,664-passenger vessel, rebranded as Celestyal Olympia in early 2015, started sailing in 1982 as Royal Caribbean's Song of America and was later owned by Sun Cruises as Sunbird. Louis Cruises bought the ship, chartering it for seven years to Thomson as Thomson Destiny before returning it to the Louis fold in 2013 as Louis Olympia. It was rechristened Celestyal Olympia after its 2014/2015 dry dock to reflect the line's greater focus on all things Greek. Celestyal (which means heavenly in Greek), has successfully established itself as an authentic Greek brand in just two years of operation. The rebrand is not just a marketing exercise. As well as a new livery of gorgeous sky blue and white, which includes the crew uniforms; the entire ship received a massive refurb in 2014/2015. This included the renovation of 160 inside and outside cabins, renovation of all bathrooms for lower cabin classes, flat-screen TVs through the cabins, and a complete overhaul of guest services on Deck 4 -- even the elevators got a refresh. A subsequent refurb (part of a rolling program) addressed an ongoing issue of noise from the theatre, installing soundproofing in the ceiling, as well as refurbishing the rest of the cabins. The ship embraces its Hellenic heritage with gusto -- and indeed the whole ethos of Celestyal is to celebrate that heritage. This is reflected in the food, the entertainment, which plays on Greek mythology; the shore excursions and the shops onboard, which sell authentic Greek goods such as shoes, food & wine, jewelry and branded goods in a new area on deck 4. Public areas have been redesigned with Greek murals representing the islands visited, and bars and restaurants renamed with Greek names -- again to reflect the Greek heritage. Celestyal Olympia operates three- four and seven-night cruises exclusively in the Greek isles and Turkey, visiting both well-known and out of the way islands -- often two in a day. Oddly, despite the rapid pace, the cruise never seems hurried and there always seems time to explore at leisure before the ship heads off to the next port of call. 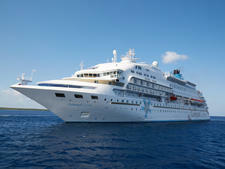 Many passengers use it as a way to pack several Greek isles in a few days. Another feature that goes over well with Greeks and Turks is that passengers can embark and debark in various ports, so it's easy to add a day or two in Santorini or Ios, and even catch the ship on its way back a week later. Celestyal Olympia is not competing with mainstream cruise lines for passengers -- it solely focuses on destination-intensive short trips -- and the experience onboard is vastly different to bigger ships. So keep your expectations in check -- what it might lack in specialty restaurants, variety of entertainment or onboard activities -- it more than makes up in giving you an authentic insight into the Greek islands. Our view is if you want to see a lot of the islands in just a few days and enjoy an authentic Greek experience, Celestyal Olympia is excellent value for both your time and money. The roster is extremely international: roughly a fifth hail from North America, 15 percent from Latin America, 13 percent from Asia and the rest made up of Europeans, including Italians, Spanish, French, Greeks and Turks. Oddly, Celestyal has had little presence in the U.K. and so you will find very few Brits onboard, though this is likely to change in 2018 as the line finally has a trade distribution deal in the U.K. plus massive exposure from the popular U.K. TV show "Cruising with Jane McDonald" which featured sister ship, Celestyal Crystal. Expect lots of student package tours in the summer months, as Contiki uses these ships for its trips geared to 18- to 30-year-olds. Passenger announcements are in English, Greek and then in the language reflecting the majority of passengers. Age-wise, again, the range is enormous -- families, young couples island hopping, the aforementioned student groups and seniors -- are all represented at all times of the year. The line has international hosts for non-English speaking individual passengers (languages include: Greek, German, French, Spanish, Portuguese, Turkish, Japanese, Chinese). Note that announcements are made in multiple languages. Passengers dress casually during the day, with comfortable excursion clothes being the norm. Make sure you bring a hat in the summer months. Evenings are equally low key; most women wear sundresses while men wear collared shirts. There is one formal night per cruise (except on the three-day cruises), where the outfits ranged from beaded jackets and black pants or sundresses for women, and sport coats or collared shirts for men. There is no need (or expectation) for formal dresses or suits. All gratuities are included in the fare; there is no way to opt out. €6 per passenger per day is given to the crew. While you are free to add more, it is not expected. The onboard currency is the euro. Holding just 1,200 cruisers Celestyal Crystal is a small ship by modern standards; nevertheless it has everything you would expect on a big ship, just scaled down.